Because "Writer's Block" Sounds WAY Better Than "Procrastination"
To my ear, "writer's block" sounds much better than "procrastination." So yea, I'm suffering from some writer's block this week--just like F. Scott Fitzgerald. Indeed, my "plan" for this summer is to finally produce a draft of my history of religion and sports in America. After a sabbatical last fall, I was able to get a good chunk of it "finished." As each unproductive day slipped by, I kept telling myself that I would get to it over summer. I found this comforting at the time. But then finals came and went, and graduation marked the end of another academic year. Now, finally, I have returned to my basement office to get some stuff done. And yet... I'm having a hell of a time getting started. To put it bluntly, I am stuck. And no amount of guilt, shame, or anxiety is prodding me forward. I suppose that I am experiencing some transition sickness. During the semester, days find a way of scheduling themselves. And there is no shortage of noise and activity. Now I'm alone, surrounded by a deafening silence, and facing down a single job. Perhaps, then, this is just a natural response to having more time and quiet than I am accustomed to. Step 1: Close your eyes and imagine a lemon. Step 2: Now, imagine peeling this lemon and separating it into four equal sections. Step 3: Finally, imagine taking one of those sections and chomping down on it. Did you cringe? Did your lips pucker? Did your mouth water? In other words, did you have some sort of physical reaction to the simple idea of biting into a lemon? If you did, then congratulations! You have an imagination! And your imagination can anticipate a physical response to something that only exists in your head. For me, this is what it's like thinking about writing. Instead of eagerly embracing the challenge of learning new things and developing my ideas, I anticipate the hours of toil and frustration ahead. And then I choose to avoid it entirely--but eating lemons is just fine, so go ahead and square that circle. It's a mess of ideas, words, and sources. When I open a chapter, I can't get past the first sentence. This brings forth all sorts of nagging questions. Can this ever become a coherent story? Even though I have written a book before, did I just get lucky? Was I unusually inspired then? And is this heap of flaming cow poo the real me? But at this point, I truly do want to finish the damn thing. That's at least a good start. What, then, should I do about it? I could begin by writing. Just writing. When I am at my most productive, I begin each day with a minimum of one hour of writing. To do this, I turn off my internet, set a timer, and hammer away. Most of what I write is junk. But there are always nuggets. And no matter what happens with the rest of my day, I have those 60 minutes to show for it. I also think that it will be worth returning this blog to its original purpose. A little over a year ago, I started Between Jest and Earnest with the intention writing frequent updates on my book. I haven't done much of this lately. Over this summer, then, I will Make This Blog Great Again with more frequent book updates. Worst case is that I admit to my ongoing.... um... writer's block. Yea, that thing. Best case, it helps keep me accountable--because accountability is a beautiful thing. 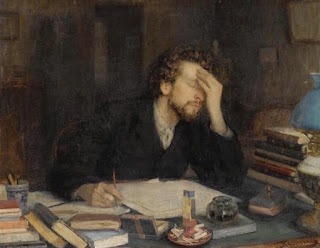 Writer block is not a a problem anymore if you visit this blog.